From the beloved classic "Gone With The Wind" this 8 inch fully articulated Wendy dolls captures the beauty and grace of Scarlette O Hara as "Belle Watling". Dressed in a vivd pink dress with a steel-grey jacket. The gown pairs a sleeveless, taffeta bodice with a satin skirt trimmed in center-front with rouched satin. The sleeves of the jacket are richly embroidered with pink roses and green leaves and. Rouched satin ribbon trim embellishes the front of the jacket which closes in the back. A pink petticoat trimmed with gathered pink tulle and black lace, matching pantaloons, black stockings and black satin shoes. A pink tulle wrap sits atop her Taffy-Tan bun with ringlet bangs, trimmed with pink paper flowers, and completes this lovely ladie's look. 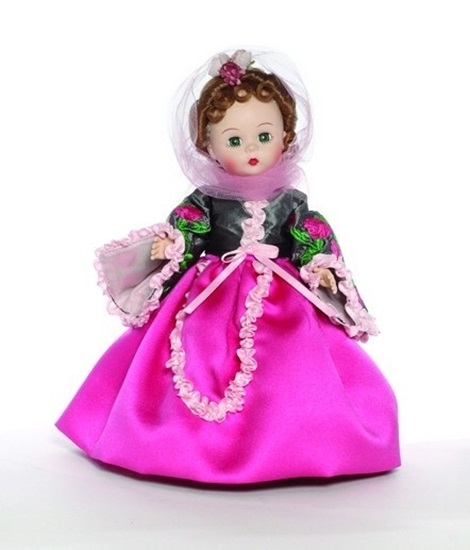 Belle Watling is 8 inches tall with blue sleep eyes and is perfect for ages 14 and up.